Requests for PVC Loom enhancements keep coming in . . . The website has been getting a lot of traffic since the March/April issue of Handwoven Magazine came out. 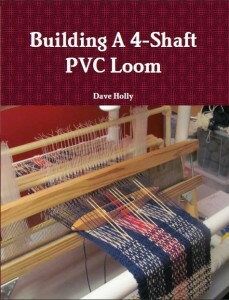 They wrote a nice little review of the Building A 4-Shaft PVC Loom book under the Media Picks section on page 14. Ever since the book was published I’ve received questions from weavers on making modifications and enhancements to the design of the loom. The main request is, “Can I add 4 more harnesses to create an 8-shaft PVC Loom?” And, the other request is, “Can I add 2 more slider bars to handle shafts 1-3, and 2-4?” I was expecting that people would be at least curious if these modifications could be done, and the answer is “YES!” I’m working on those now and will make the modifications available over the Internet probably by early Summer. The other question I get is about making the PVC Loom bigger. “Can I make it 3 feet wide?” Well, I’m not sure about this. I think you may be able to make it bigger – but you may have to increase the diameter of PVC Pipe used. Going out to 3 feet will make a frame that is more susceptible to bending. The problem is that it may look great when you first build it. But, after using it for a year or so, you may notice the pipes bending under the tension of the warp threads. The current design uses 1 1/4″ PVC Pipe for the frame. Using 1 1/2″ may work for a wider loom. And, there is also a 2″ diameter pipe you could try. But, remember that there are several other parts that need to be widened if you are going to try this. Besides the front and back beams, there are the front and back rollers, the reed frame, the harnesses, and the action board on top. The action board needs to be as wide as the harness frames so the Texsolv cord can reach the harness frame ends. One other note . . .
I’m about to finish modifications to the very first PVC Loom I constructed. It was the prototype and had an older version of the action board. 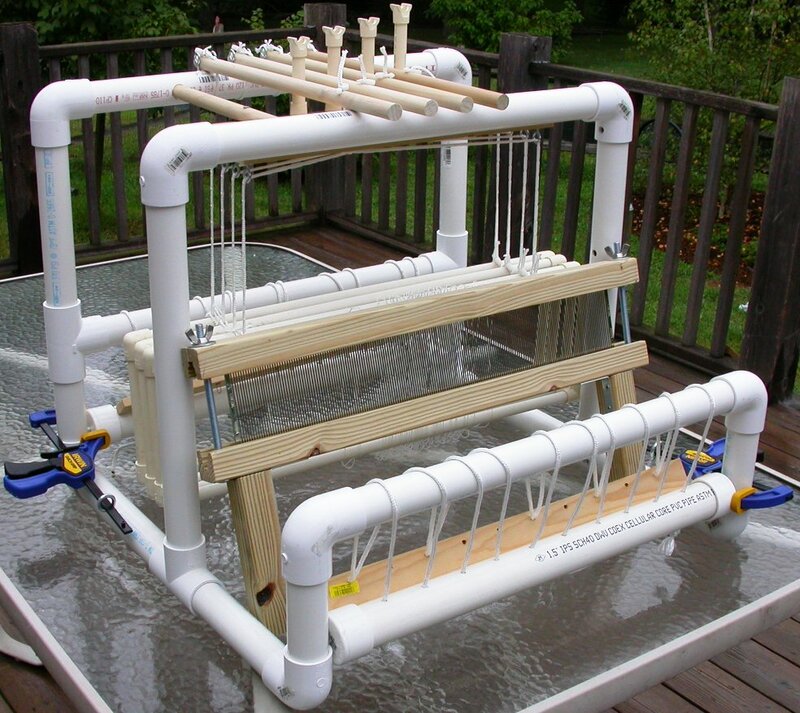 I am outfitting this loom with the improved action board and getting it ready to weave some towels. The interesting thing about this PVC Loom is it’s narrower than the final design. It can weave approx. 21 inches wide. (This was before I noticed that a 24 inch wide frame only has about 21 1/2 inches of usable front and back beam inbetween the elbow joints of the PVC pipe. Oh well – live and learn. ) But, I noticed that it’s actually quite nice at this size. It’s hard to describe, but I like the feel of this loom. Maybe it’s the nostalgia of being my first PVC Loom, but I’m taking special care in reviving this old prototype. I’ll have some pictures to post soon. Here is a photo of the original prototype. This is from about 2003.